Christmas, the festival of the Incarnation, is a bridge to culture, to all cultures of life. Like a magic wand of inculturation it elicits and shapes the noblest features of people and traditions. Paul Kitamba, an Akamba carver from Kenya, was given the magic wand. His 2008 Massai nativity fashions ethnic reality into truth made beauty. 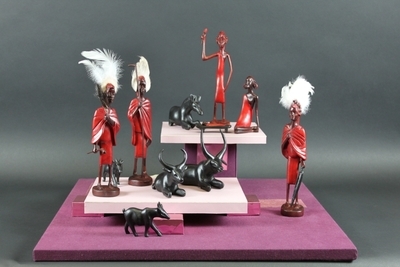 11 wood hand-carved figures, created in 2008 by the Akamba artist Paul Kitamba, in Kenya. The figures depicted include Mary, Joseph, the infant Jesus. Exhibition label written by Father Johann G. Roten, S.M. originally for exhibition entitled "African Symphony" held at Roesch Library, University of Dayton.